Listed a little over 1 month ago, Hale Kamaole 203 is a premier front row unit with across the street beach access to Kamaole Beach Park III. Set back about 75-100 yards from the beach, the Maui lifestyle will truly be the main attraction of this unit. Upgraded within the last year, the unit is move in ready and for use either as a vacation rental property or private 2nd home for personal use. Boasting vaulted ceilings, the unit lives a lot larger than 1112 sqft suggests. Offering a lofted space above the kitchen, it adds another dimension to the unit and allows for more living space than some of the other 2 bed room units. With two spacious en-suite bedrooms, great ocean views, and an updated kitchen, the unit is able to offer it all. 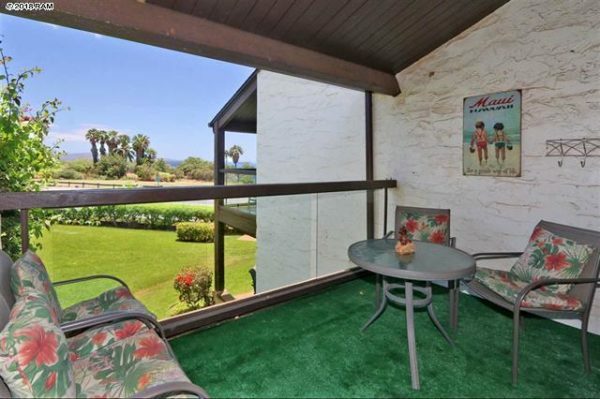 The 100+ sqft lanai off of the main living area is a nice space for entertaining or being used as another living space. The open concept floor plan allows for a continual living area and maximized floor plan space. The flexibility of the unit to be used as vacation rental when not being used by the owners is a huge plus. Some owners rent it out full time and are able to generate significant cash flow. 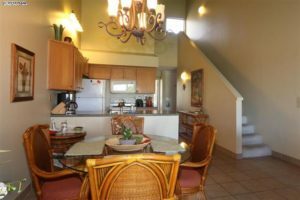 Buying into the Hale Kamaole community is a savvy move among buyers because it is a valued Kihei condo complex because of its across the street location from one of Kihei’s best beaches, Kamaole Beach Park III. So far in 2018, the market has been able to average more 1 sale per month which is a nice return; however, other Kihei condos for like Kamaole Sands and Maui Kamole can see almost twice as much production due to the sheer size and turnover in each complex. 50% of the condos sold this year were able to find a buyer within 3 months of coming to market and buyers must be aware of that if they are considering purchasing. The Hale Kamaole market offers interesting pricing tiers because on one hand, you can pick up properties in the $300k price point; while on the other, some buyers pay well over $700k. A variety of aspects contribute to the various price scales including: the view corridor to the ocean, lanai size, level of upgrades done over the years, and the rental demand/history. The $400k price point was the dominant with 70% of the sales, the $300k price range was 2nd with 20% of the sales, and the $600k range making up the remaining 10%. On average, buyers should expect to pay anywhere from $500-$650 per sqft. 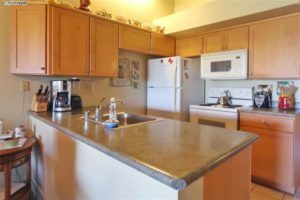 At this time, the Hale Kamaole Condos For Sale market only has 1 unit for sale and it is featured above. Listings can come to market in waves and is cyclical depending on the visiting season. Expect more listings to be listed as the winter visiting season approaches. The best way to stay up to date is with our Hale Kamaole new listing email alerts.